As a Minneapolis wedding photographer, I often get asked what camera gear I use when meeting new clients. 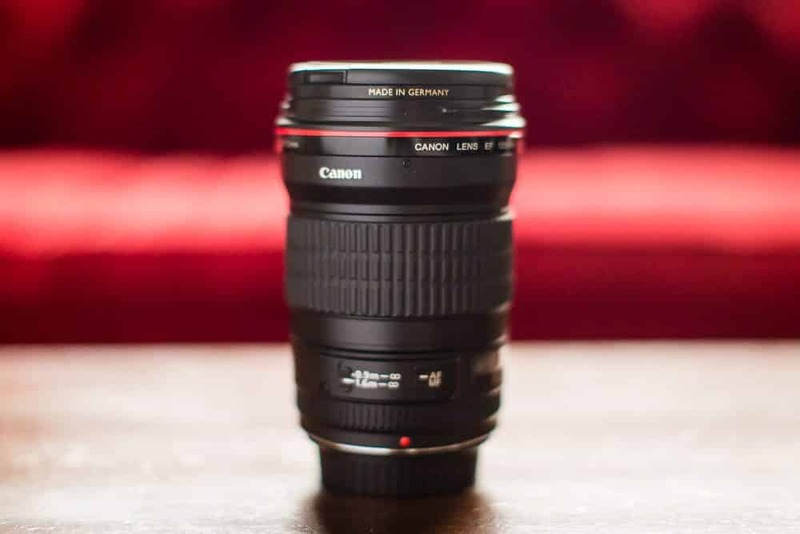 While I often say “Canon professional gear and backups”, I thought it would be helpful if I took some time to review the items I use and explain how I use them. I’ve got A LOT of gear, so this will be quite a post! First of all, yes, I am a Canon user. When people ask about using Canon vs Nikon, it’s a bit like asking “Coke vs Pepsi?” They are both equally great at what they do, and in the end, it’s all about how comfortable each person is with their gear. I happen to fall in the Canon camp. 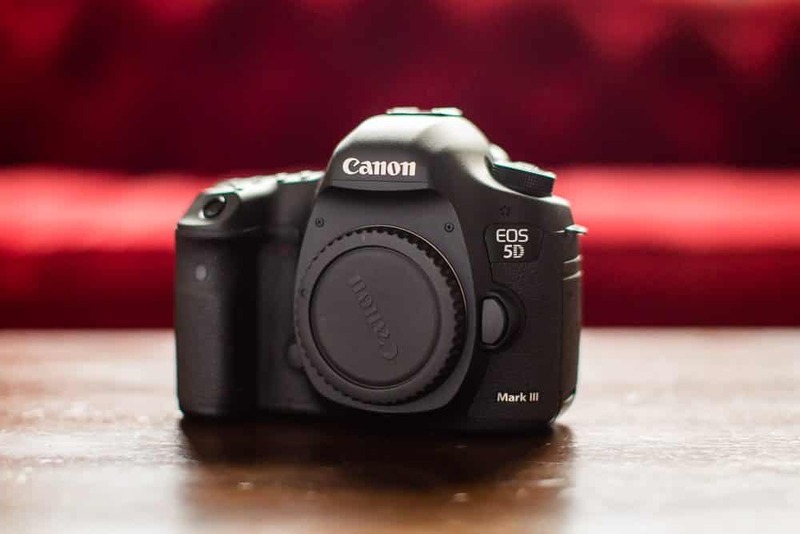 My primary cameras are the Canon EOS 5D Mark III. They are amazing workhorse cameras. They have fast and accurate focusing, quiet operation, and excellent low-light capabilities, among many other things. The fact that they also have two card slots, for making two copies of each image, makes it a natural choice for Minneapolis wedding photographers. 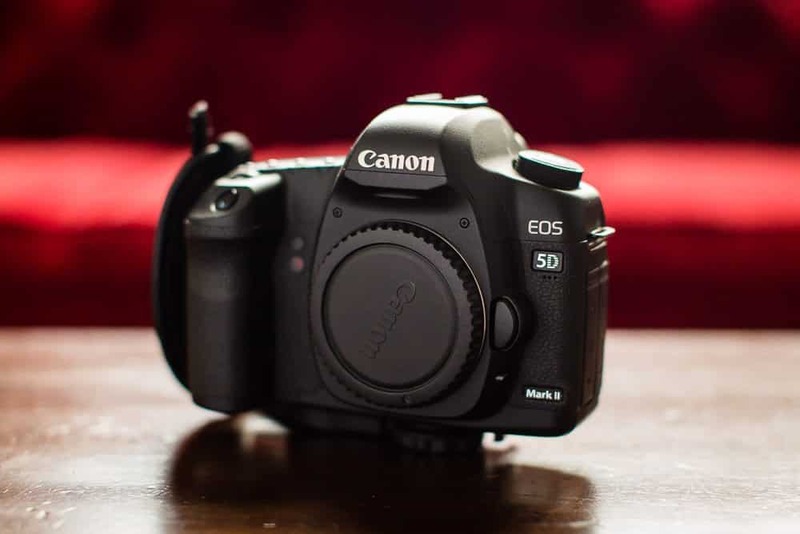 I also use a Canon EOS 5D Mark II which has been converted to an infrared camera. Infrared is a certain wavelength of light that is not visible to our eyes. While the images I create are in black-and-white, the biggest difference is that all greenery looks white in an infrared photo, giving the images a dreamy, “otherworldly” feel to them. I have a lot of fun with this camera! I use a Canon A1 film camera when I want to use film. One of Canon’s best – and the last – film camera they ever produced. Now, on to the lenses. 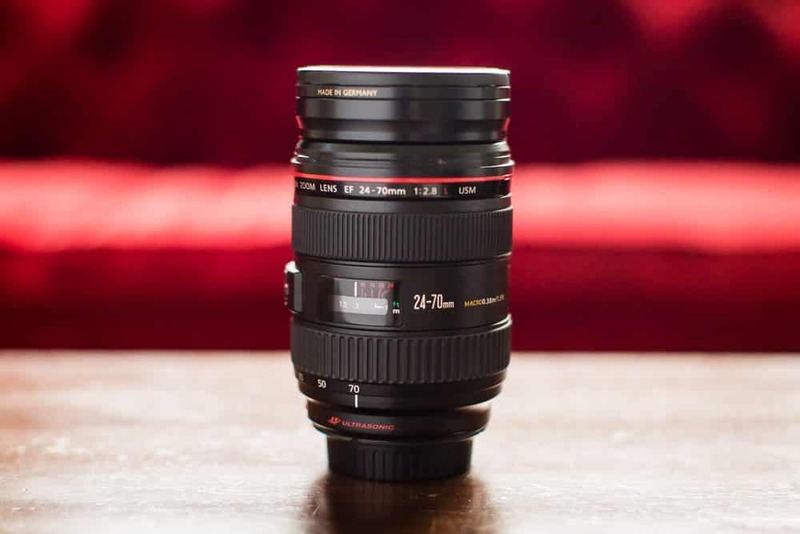 As a Minneapolis wedding photographer, I primarily use fixed-focal length lenses. The benefit of them is their excellent sharpness and crispness, as well as the ability to go “wide open”. That means I can open the apertures very wide to let a lot of light in low-light situations where I may normally need to use additional lighting. It also creates a very sharp plane of focus so my backgrounds can often blur out to help the focus settle on my subjects. First up is the Canon 35 1.4L. 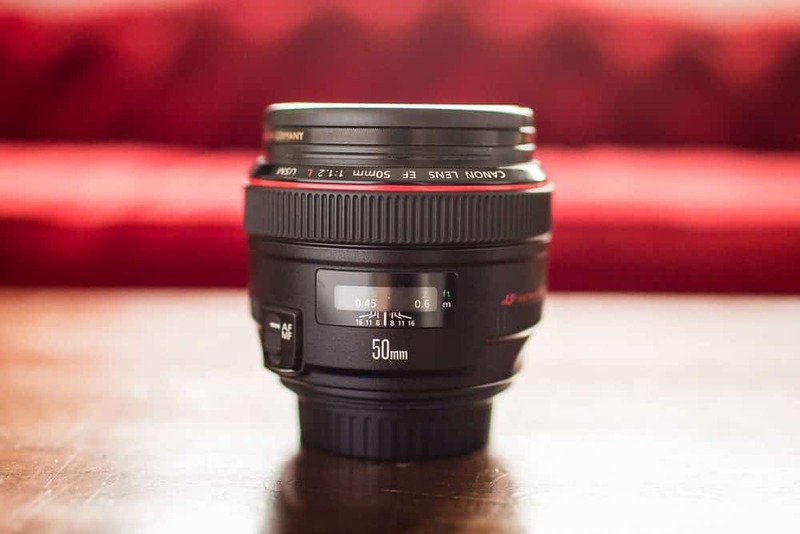 This is a lens I like to use for full room photos, large groups of people, and wide shots where I want to get a lot of the environment (such as details during the reception.) 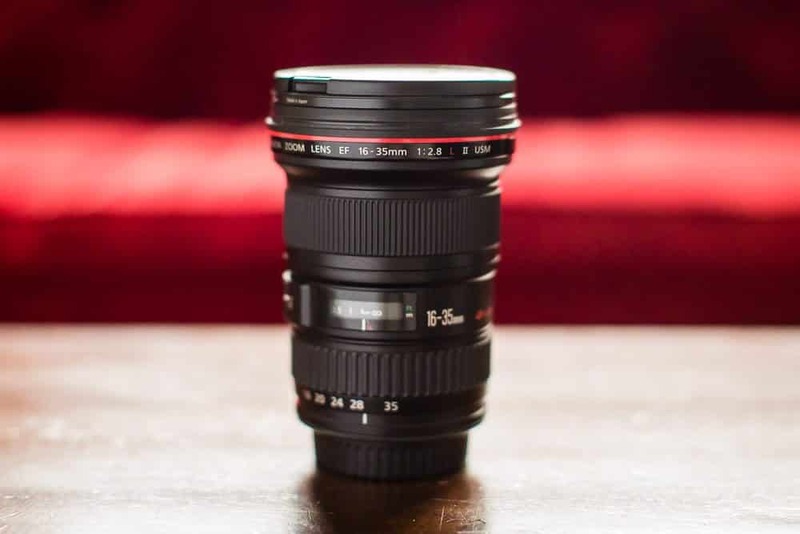 This is one of my most-used lenses at weddings. Next is the Canon 50 1.2L. 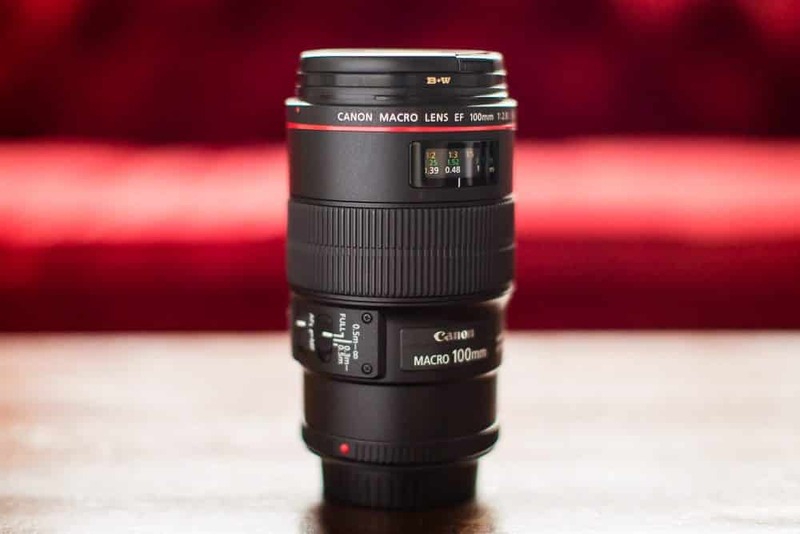 This is a good mid-range lens that I use for portraits of small groups or families. Next is possibly my favorite lens, the Canon 85 1.2L. This thing is all glass. It weighs 2 pounds by itself! 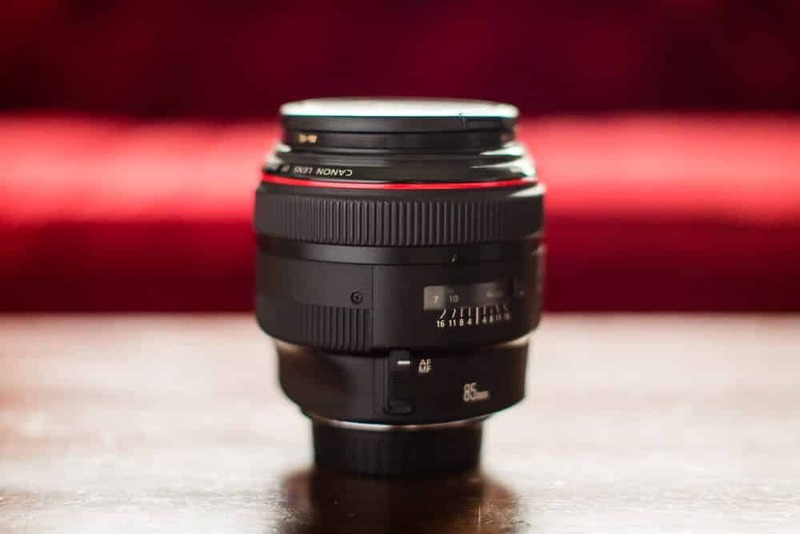 It is the perfect portrait lens, and along with the 35, is my most-used lens as a Minneapolis wedding photographer. I also love it for engagement and individual portraits, so it gets a lot of work. The Canon 100 2.8L Macro is the lens I use for all my ring shots and other fine detail work (such as invitations, flowers, jewelry, etc.) There is really no other lens that can do what it can! 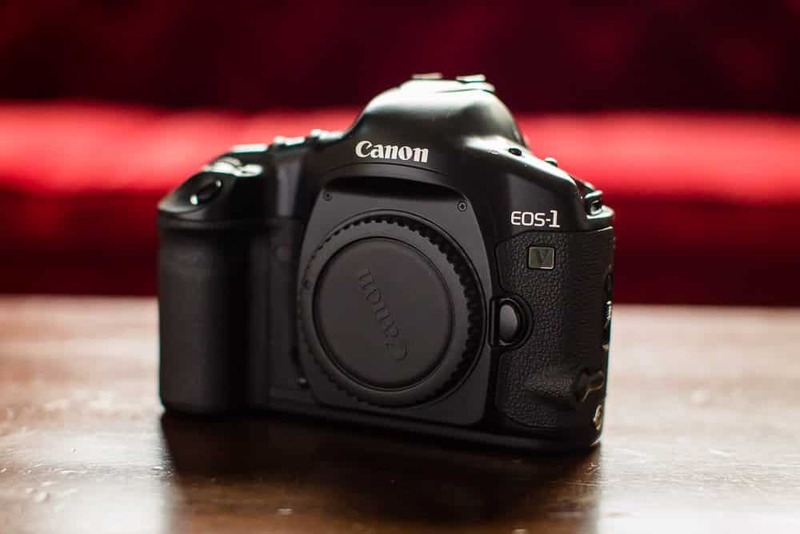 The Canon 135 2.0L is an amazing lens for very low-light weddings, smaller weddings and even toasts where I need to stand far away from the action. Next I have a series of zoom lenses. While they are not my favorite for using all the time, there are times where I do use them. They also serve as the perfect backups for all of my fixed-focal length lenses, as they cover the entire spectrum (and even a bit further) of the fixed lenses. The Canon 16-35 2.8L is an amazing lens. It is super-wide angle, and I love it for large room and environment photos. It’s perfect for capturing dramatic environments during weddings and portrait sessions. It may not see a lot of action during any wedding or session, but the images it captures tend to be pretty jaw-dropping. 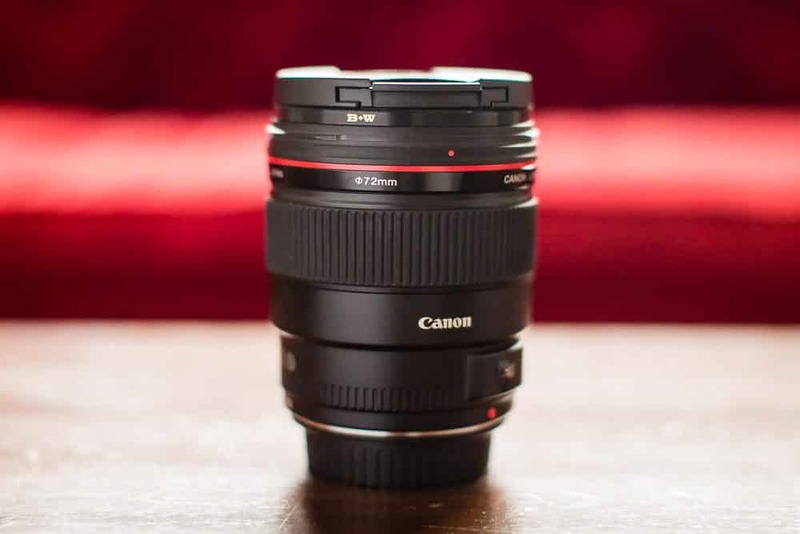 The Canon 24-70 2.8L is a pretty standard mid-range lens. I keep it primarily for times when I can only use lens and know I will need both wide-angle and telephoto images. It doesn’t see a lot of action, but is great to have as a backup. 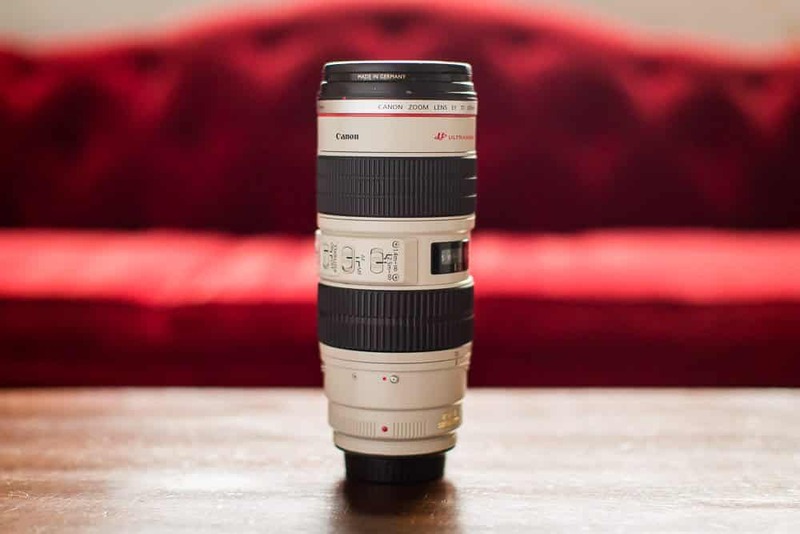 My last lens is one of the most important – the Canon 70-200 2.8L. This is my go-to lens as a Minneapolis wedding photographer when I have to be at the back of a church or far from the action (which is often.) I occasionally like to use it for portrait sessions too, but only when I have a lot of room to walk around. Last but not least, I also use a full portable lighting kit – 4 flashes with stands and triggers, various soft boxes and other lighting modifiers, battery packs and additional backup equipment. 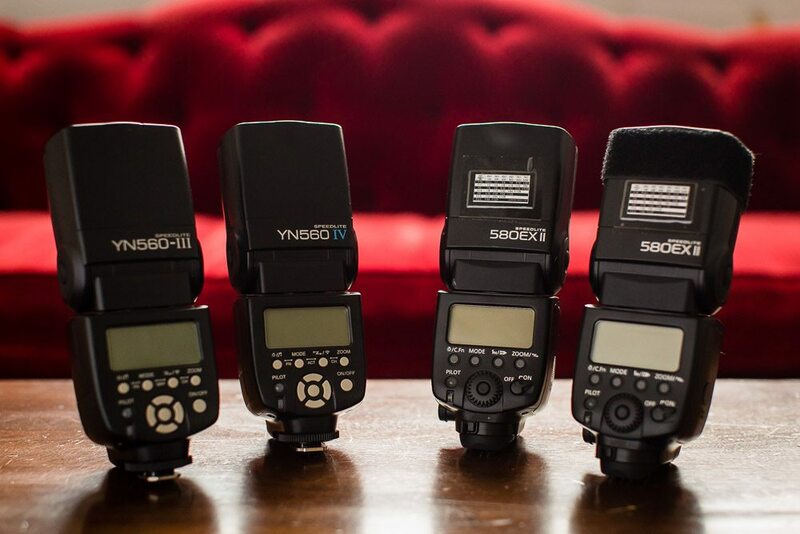 I love shooting with off-camera flash to give more natural lighting to my images, so these tools are essential. I hope you found this tour of my camera gear helpful! You can see that I am well-prepared for the challenges of being a Minneapolis wedding photographer!